I don’t often eat at (or write about) generic fast food chains, but every once in awhile something will catch my eye, and I just can’t resist. This blog was practically launched on my reporting about the craziness surrounding the opening of Chipotle in my building. I also wrote about the one Europa Cafe with a burrito bar, the new oil at KFC, and that weird Wasabi Salmon Bagel thing at Au Bon Pain. This particular item highlights my weakness for those fast food “Limited Time Only” menu items. Enter Cosi. I was walking by Cosi the other day and noticed a sign in their window for two new sandwiches. I’ve written about Cosi before. I know I rail against paying $8 for a sandwich, but for some reason Cosi is the one place I’m willing to do it (I’m pretty sure it’s the bread. They must put crack in it.) 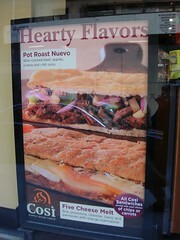 So when I saw their new Pot Roast Nuevo Sandwich in the window, I was like “I like pot roast!”, and it’s freezing cold. What better way to enjoy pot roast then in delicious “Only for a Limited Time” sandwich form. The cool thing about the new Pot Roast sandwich is that it’s not just Pot Roast. They top it with Jicama, Green Apple, Red Onion, and a chili salsa. The pot roast was super tender, and the apple & jicama added a crunchy sweetness that took the thing to another level. The first half went down without a problem, but it started to get a little messy during the second half, as the juices ate through the bread. All in all it was pretty delicious, and perfect for a super cold day (like today!). 11 W. 42nd St. btw. 5th & 6th Ave.
60 E. 56th St. btw. Madison & Park Ave.
685 Third Ave. on 44th St.
498 7th Ave. btw. 36+37th St.
1633 Broadway btw. 50+51st. St.
Posted by Zach Brooks at 9:38 am, January 25th, 2007 under *3rd Ave. btw 43+45th, *7th Ave. btw. 36+37th, *B'way btw. 50+51st, 42nd btw 5+6th, 45th btw. Mad+Van, 48th btw 5+6th, 56th btw. Mad+Park, Sandwiches. I love me some Cosi! You are too funny with the crack line… I often think that myself. 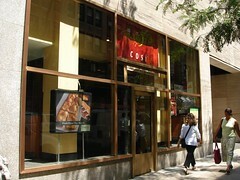 Here’s a Cosi tip for you – AM New York sometimes has $2 off coupons…making their sandwiches a much better deal. Now, about that Five Cheese Melt. Fool that I am, I looked up the nutrition info on the Cosi web site. That thing has 1,046 calories — about twice as much as the Pot Roast Nuevo. It’s also got 56 grams of fat (as opposed to 10 grams for the Nuevo). Jeez Louise. I want to live to see 2008, and it ain’t gonna happen if I indulge in this (admittedly delicious-sounding) sandwich. Here’s another tip. Not sure if this is true at all Cosis, but the Cosi at 48th (bet 5th/6th) is switching to a new frequent diner system with swipe cards. So if you have one of those old stamp cards, you can trade it in for a free sandwich or salad! And the stamp card doesn’t even need to be full! Cosi’s bread is irresistible. I seldom eat there, though, because the prices are indeed awful. But I can’t remember the last time I saw jicama in midtown, so I reckon I’ll have to give this a try. After reading this post this AM, I just marched down to Cosi (32nd and Park–kinda like Midtown-south) and got the sandwich. It is very tasty. I’m not sure if they were out of the chili salsa or if it is just mixed in with the apple mixture, but I didn’t see them put any on. Still-its a good tasting lunch. The one thing that annoyed the hell out of me–the total came to $8.01, and I didn’t have a penny, so she gave me $1.99 in change. Geez–just let the one cent slide. Great. I have been so good with the bringing of the lunch, to help with the managing of the finances, and now I am forced to find out where Cosi is near my new-ish office. Bad enough that I work next to the Bistro and its udon and bulgogi, now I have THIS temptation. The Snack Wrapper at McDonalds (aka the fried chicken finger in tortilla) at McDonalds is awesome! It’s actually pretty damn tasty. It makes all the difference which McD you go to- avoid the one on 2nd and 39th. Dude, I LOVE Cosi. When I’ve had a bad day at work, I treat myself to the Cosi club with guac- I lie and say “it has turkey so it’s good for me”- it’s delish if the right person puts on enough guac. Unfort., with guac, it comes to like $9.50, which pisses me off but sometimes they don’t charge me. Sigh. This looks delish and I love jicama, I may have to switch it up (I’ve only ever gotten the Cosi club). Mmm, yummy. Thanks! Oh my god, I have to go to Cosi tomorrow. Thank you for posting about this! The snack wrapper is pretty amazing. You gotta get two though – there’s really only a single chicken finger in each tortilla. A group from our office goes to the hidden COSI all the time. The Pot Roast sandwich and the BTM are the favorites. There is a $2 coupon in AM New York (free) on Tuesdays and Thursdays. A couple of weeks ago, we took about 50 copies of the paper and cut out all the coupons so we always get the sandwichs for $5.84. 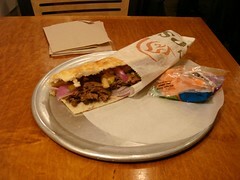 Even better if you use the Cosi card and get 1 free every 10th sandwich (knocks it down to $5.2 average). I went to Cosi to try this today. I got it without apple. Apple and meat, does not work for me. I thought it was pretty good, an interesting flavor. The bread got a bit soggy. If not for the price I would have it again. I don’t know about crack, but that bread is really really salty, there is even rock salt on the top like a pretzel. It’s good though. Maybe you’re satisfying some sort of mineral imbalance, like a salt lick. Pot ROast sandwiches are up there with the post thanksgiven turkey sandwiches!